Claire Buchan is hardly over the moon about the prospect of her sister’s hen party; travelling from the UK to Nashville, Tennessee, for a week of honky-tonks, karaoke and cowboys. Certainly not straight-laced Claire’s idea of a good time, what with her lawyer job and sensible boyfriend, Philip. But then she doesn’t bank on meeting Rafe Castello. On the surface, Rafe fits the cowboy stereotype with his handsome looks and roguish charm but as he and Claire get to know each other, she realises there is far more to him than meets the eye. Can Claire keep to the holiday mantra of ‘what happens in Nashville, stays in Nashville’ or will she find that some things are far too difficult to simply leave behind? Available as an eBook, audio CD and audio download. This is an adorable romantic comedy that will bring some sunshine into your day. Claire goes to Nashville as part of her sister’s hen party. While she is there she finds herself. Promptly ending her long term relationship with Philip because she realized it can no longer be resuscitated. Claire and Rafe start off on the wrong foot but she can not help but be attracted him. I doubt anyone us could. A romance ensues born out of mutual electricity and it soon gets as steamy as the Tennessee humidity. Rafe is full of surprises. He is a complex character and not just the local eye candy. He is everything a romantic hero should be. This was a good old Southern fried love story. Being American myself, I could recognize all the locations and wonderful descriptions of all that delicious southern cooking. I came away feeling like I had been to Nashville, that is how vivid the book was. 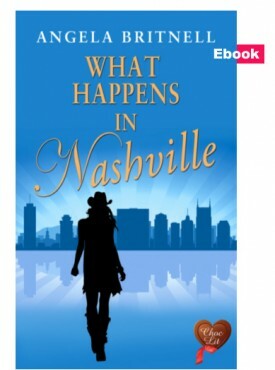 What happens in Nashville was an effortless read. Put on some country music, sit back with an American style sweet tea and enjoy this wonderful read. If I could describe Rafe, Angela Britnell’s Romantic hero from What happens in Nashville; in term of chocolate- he would be a Thornton’s Dark Caramel. Seductive on the outside but deliciously soft on the inside- with an added bite!